This man started with an old, beat-up Mercedes-Benz CLK-Class. 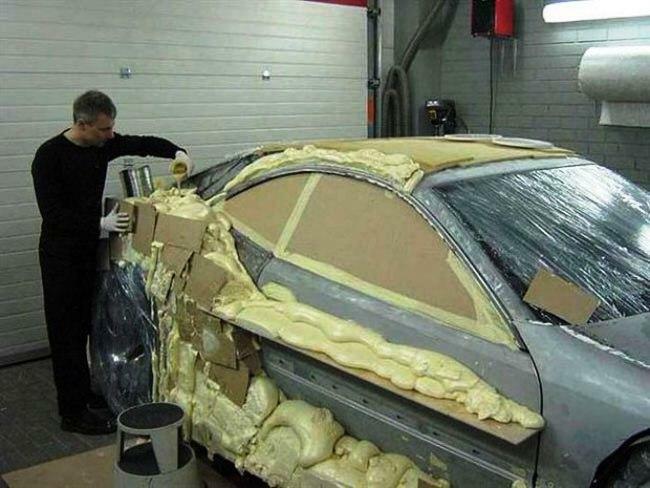 Once he acquired the vehicle, he started to play with some expanding foam. It may look like a disaster now…but wait until you see the result. Time to carve out his vision. This is one of the hardest parts and you have to be an artist to get it right. Pieces of cardboard are used to get the shape right. Then it’s time to smooth and detail the exterior. It may not seem like much at this point but wait for it, it gets prettier. The final details of the exterior are almost done. Ain’t nothing cool about that backside. Dream cars have curves. The difference is in the subtle nuances.